Architecture has evolved over time and it will continue to evolve in the future. Modern techniques, greater choice of building materials and a desire to go bigger and better than ever before mean our world will always change and adapt. But while innovation is a wonderful thing, we have to protect our roots. This is why many architects strive to find a way for old to live alongside new without being overshadowed – with some of the most impressive developments taking place in historically sensitive contexts. An example of this would be our work on Gippeswyk Hall in Ipswich. This project allowed us to embrace the history of a building but add a new dimension to the site to create a lasting home for The Red Rose Chain – an independent and self-sustaining theatre company. The 16th century building had a Victorian lean-to extension along with a 1960s single storey pre-fabricated unit in very poor condition. While the 1960s-annex needed to come down, the lean-to offered opportunity for renovation and restoration. We were also asked to introduce a new building – a studio space – which was to be environmentally friendly and sustainable. This was built in the style of a traditional Suffolk barn and was linked to the Hall and the pitch and width of the studio gable was made to match the existing proportions of the original building. This was the most striking and noticeable design element and ensured both buildings were perfectly in line with each other so the new building did not project in front of the Hall as seen from the main approach. A clear space was expressed between the two gables formed using a glass walkway. This glass connection made a main public entrance and foyer space with toilets. Our project demonstrated the care, conservation and adaptive re-use of an historic building. But it also has given the community a much-valued resource. Old structures should not be retained as artefacts, relics of a bygone age. But nor should we forget or overshadow architecture of the past with buildings for the future. This brings us to the Phillippe Starck project – commissioned to design a “habitable, surreal and poetic work of art” by the Hilton Group. 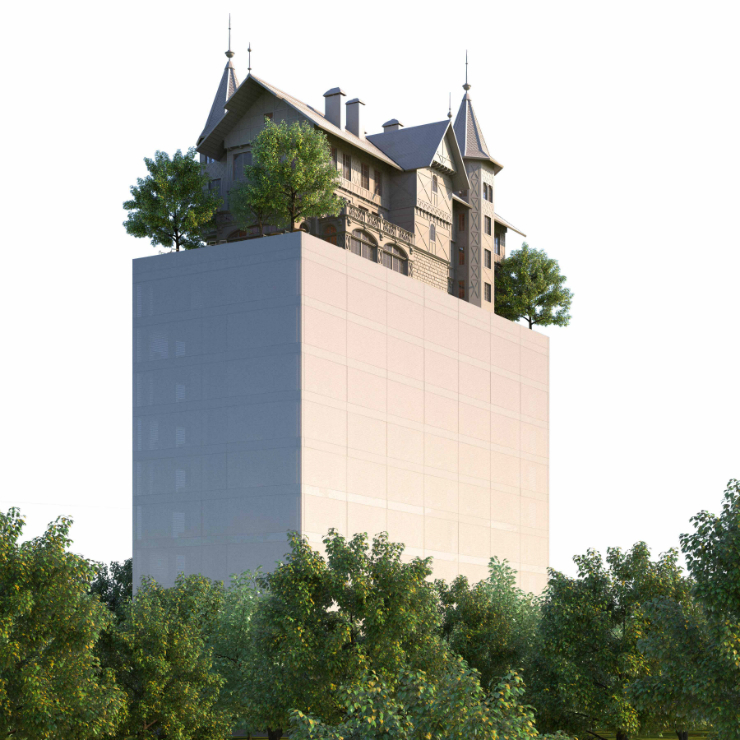 In an arrangement that Starck describes as” phantasmagoric”, a traditional regional home will be placed on top of a monolithic and monochromatic hotel tower containing 119 rooms and suites. The house, which will contain a restaurant and lounge bar, will be surrounded by a rooftop terrace and garden. Of course, the house will be part of a new build. But it harks back to architecture of the past – serving as a reminder that it still has an important place in our built environment. In this case, it actually sits on top of the tower block. Starck is known for his inspirational approach to architecture and design. Here an assortment of building types appears to be stacked on top of one another. The nine-storey building comprises three tiers. At the lowest level, a gabled timber chalet sits alongside a row of shop units, which together support a six-storey apartment block in the middle section. Above this, two vernacular houses appear to be sitting on the roof.